Learning how to coach volleyball means learning how to teach. We don't just give you a list of drills and send you on your way. We give you foundational coaching principles that will help guide and shape your own coaching beliefs. Coaching Volleyball Is So Much More Than Running Drills! 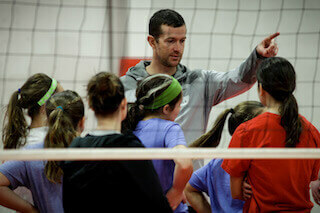 If you want to become a great volleyball coach than learning how to teach the game should be high on your list. Too many coaches rely on drills to do their work. Good drills are important but consistent feedback (teaching) should be a integral part of everything coaches do. So much of what we do at GMS is based on the laws of learning. In other words, we want to know how our athletes best retain and process information. By limiting information via simple teaching keys we can accelerate the rate at which athletes (and coaches) learn new skills. We not only want to give our athletes a lot of reps in practice, we want to give them the right kind of reps. We will teach you how to find the balance between blocked, cognitive drills and random, game like drills. There's a time for blocked practice, we just don't want to spend all day in those activities. Giving great feedback is a skill that coaches should continuously try to improve upon. This requires a good coaches eye, a strong but consistent voice and of course compassion when needed. Furthermore, you can't be afraid to slow down or stop a drill in order to give feedback. 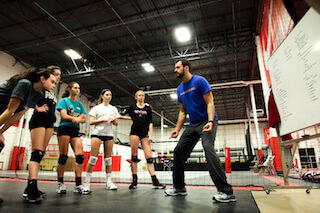 Learning how to coach volleyball is an exhilarating (and challenging) process. At Gold Medal Squared we want to get fully invested in your development as a coach. We mentor new and inexperienced coaches every day! It's where we spend a significant amount of our time and energy. 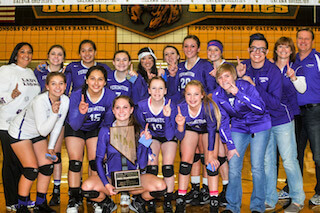 If you're a new volleyball coach there's no better place to start. We will walk you through our material and continue to support your development as times goes on. We've always said that coaches should build systems around the abilities of their players. Getting creative and experimenting is the fun part! However, too many coaches will "fly by the seat of their pants" when exploring different options. While our eyes will get it right sometimes, we can't rely fully on what we see. 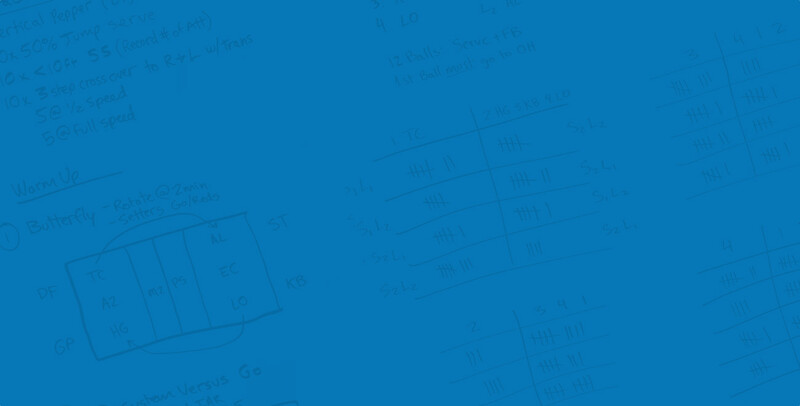 It's great if our coaching decisions can be guided by data and of our principles. We will show you how to gather statistics, which statistics matter most all while keeping things simple and easy to understand. USA Men's Coach John Speraw talks about his experience with Gold Medal Squared, suggesting that it's one of the best resources for those wanting to learn how to coach the game of volleyball. Learning how to effectively communicate with your athletes during practice is perhaps the most important skill to develop as a new coach. We need to know how athletes best learn, we need to be aware of our tone and we can't talk too much! Humans have a limited ability to process information. At Gold Medal Squared we will help you learn how to give efficient, effective feedback that will speed up the rate of learning with your athletes. USA Men's Assistant Coach Mike Wall talks about the differences between high level, international volleyball and lower levels such as high school and club volleyball. As it turns out, volleyball coaches at all levels of the game deal with many of the same challenges. Watch this video to learn more.